Sir FZ's Personal Blog: Fareeq el Atrash Debut Album Release! 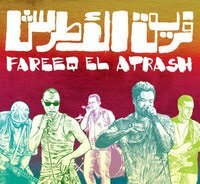 Fareeq el Atrash Debut Album Release! Forward Music is pleased to announce the release of Fareeq El Atrash’s Debut album in a Live concert followed by a CD signing. @ 11:30 pm. Free Entrance. Come all, come many! Fareeq el Atrash is a live hip hop band from Beirut, Lebanon. The band is spearheaded by the region's finest and most lyrical emcees, Edd and Cappuchyno, along with Lebanon’s foremost beatboxer and live vocal effects man, FZ. Fareeq el Atrash has been on the local music scene since 2006 backed by multi-instrumentalist Ghassan "Goo" Khayyat, and bass player John Imad Nasr. Fareeq El Atrash will capture your emotions with their live hip hop sound, laced with neo-soul, Funk, and rock. They will also capture your mind with the lyrical content of the songs that cover personal storytelling through relationships and romance, to current social issues and political diatribes. Fareeq el Atrash is a band that embodies a generation’s state of mind. They are grounded in Beirut but their message and style is universal: Lyrical and musical Protest! This debut album is a product of some of the toughest times in Lebanon in recent memory but at the same time It will make you nod your head and stomp your feet on the dance floor because of the summery and joyous feel it projects. Veteran drummer, Fouad Afra and a full horn section join Fareeq El Atrash on this debut album setting a new standard for hip hop coming out of the Middle East.